Here’s a little idiom for when you’re using one key for the value of a stacked bar chart but want to map a different ValueProvider onto your tooltip (or label). return tooltip == null || tooltip.equals(_chartConstants.emptyLabel()) ? 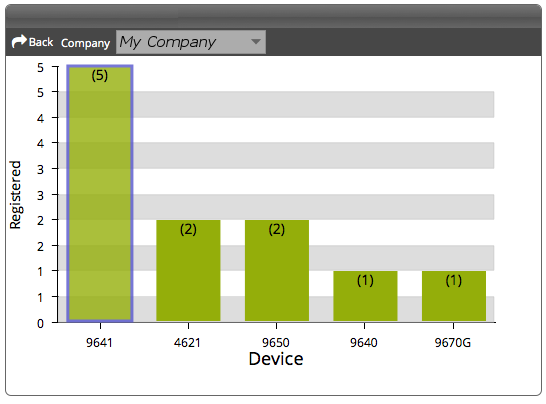 By default, Sencha GXT charts only passes in the valueProvider and the data item used to render the stacked bar chart. So what if you want to provider a different value for the tooltip or label? How do you add text? Since be follow the google datatables JSON format, we use a key of “v” in a cell array to represent the numeric value used to generate the chart. We use a key “f” in the same cell array to represent the tooltip. Here’s what our JSON looks like and here’s the resultant store (After the adapter transforms the data). 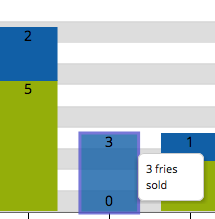 "f": "0 hamburgers sold :("
My latest assignment at work was to use charting in GXT and build a widget that has the ability to render one chart and drill down into charts of greater detail when the user clicks on an object in the parent chart. 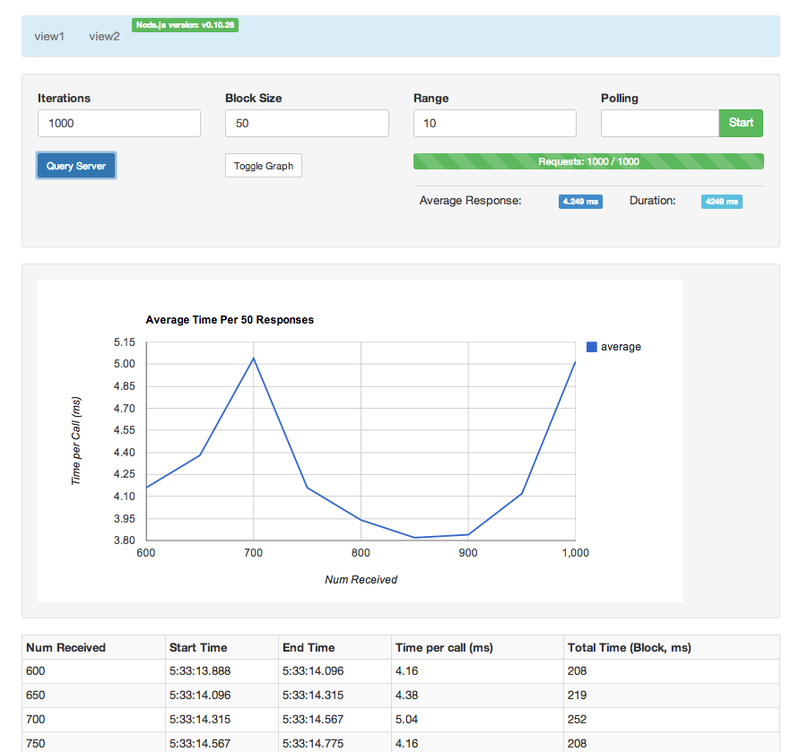 To complicate matters, the data used to render the drill-down chart is variable depending on the parameters passed in through our REST API. Finally, I wanted to encapsulate all this behavior within a portlet that could be added to a portal container by the user. How did I solve this? For the drill-down chart, I decided to implement my own object which takes an object called ChartConfig. My ChartConfig class is just an object containing various options on how to render the chart, including what optional parameters to pass into my REST call. I then defined my custom chart object to take this configuration into account when rendering itself. buildChart() is simply a method that uses the configuration, instantiates a new Chart and sets the ListStore that's used to render the chart. Don't worry about the StackedBarChartModel(). This is a custom data model and adapter that I had to implement to convert from JSON (following google's datatable format here: https://developers.google.com/chart/interactive/docs/reference#dataparam) to a ListStore consumable by Sencha (an entirely different battle. To be described in a follow-up post). * and appended to the base REST URL. * If options == NULL, the default url is used. In the method above, you can see that after the REST Call is made and the JSON response is parsed into a ChartObject (basically a schema defined to work with Sencha's JSONReader), I use the adapter to convert the ChartObject into a ListStore which is then used to update the store which renders the chart. 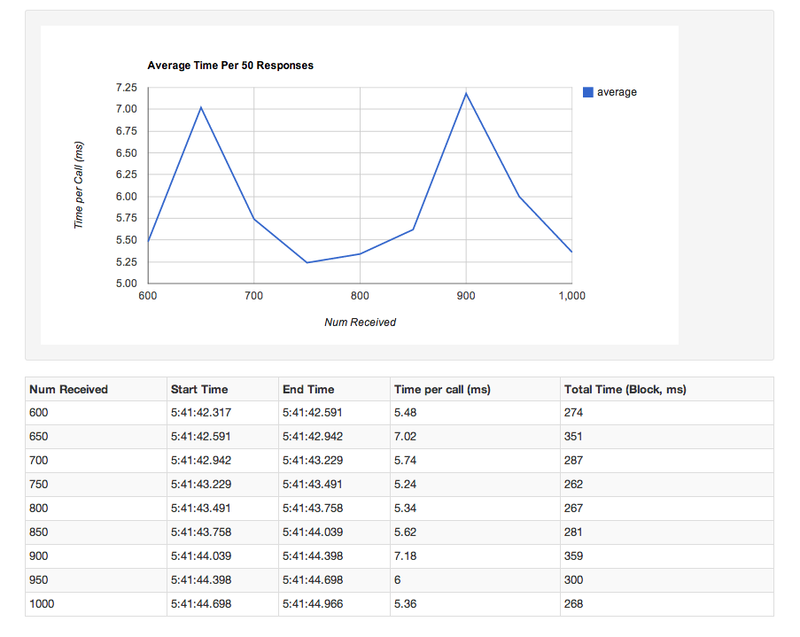 Here's an example of an implementation for my bar chart of buildSeries(). Create a model to represent a ListStore which is used in a chart. This framework makes it so that any charts that we add to our portal are able to be updated simply by calling the “refresh(ChartConfig config)” method. 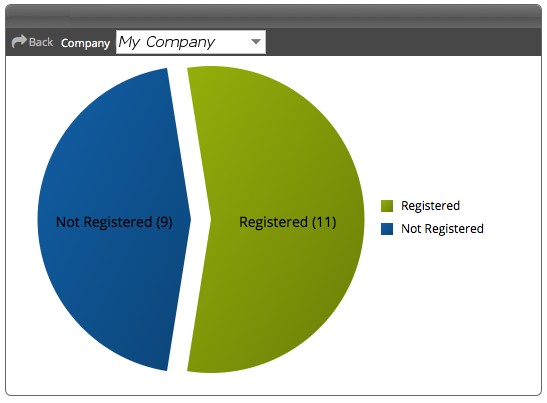 In our portlet, we have a pie chart that contains drill-downs to bar charts depending on what slice you pick. Before binding the drill-down event to the actual pie chart, I just wanted to make sure that charts could rerender properly. 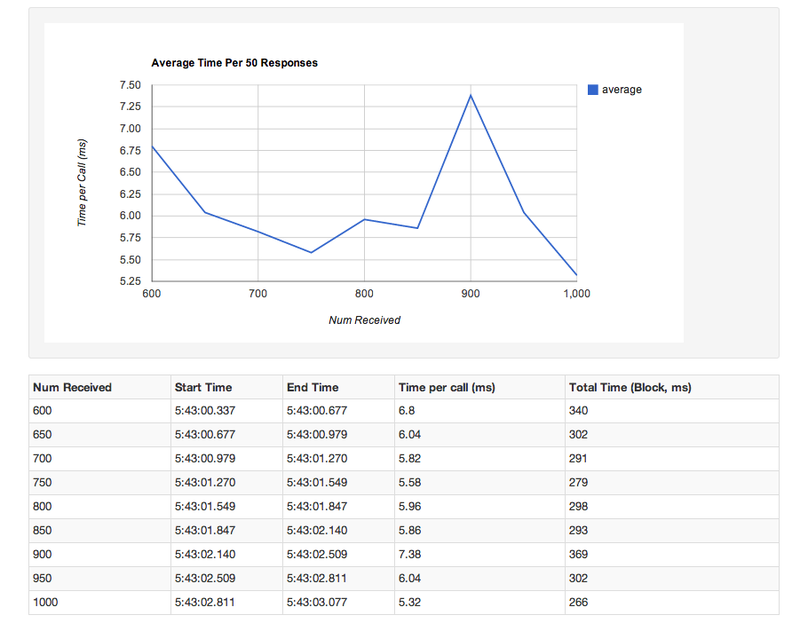 I did this by creating an entry point to the refresh(ChartConfig config) method on my bar chart object. I added a selector to our portlet widget and bound it to a “toggleView()” method which basically just generates the ChartConfig based on the selected value and calls refresh on the correct chart. Notice that I set both charts to visible(false) so that they don’t appear to the user. When implementing the buildSeries() method for both my pie and bar charts, I actually make the chart visible after the rest call returns. Finally, the last step was to bind the handler to the actual slices of my pie chart. One thing to keep in mind here. Because the handler is bound to the series of the pie chart, I couldn’t rebuild the pie series otherwise the event handler would actually fall off. Thus, I knew that after the first time the series was built, I needed to bind the handler, then leave it up to the ListStore to regenerate the pie chart. To do this, when I instantiate the pie chart, I had to set an empty ListStore to the store to render the pie chart. I’ve also included my buildSeries implementation for the pie chart below so you can see that I don’t rebuild the series at all with the pie chart. *  This is done only once. _series = createPieSeries();   //Note that this is only created once. In the portlet widget, which as described above has both a pieChart and a barChart, after instantiating the pieChart, I bound the SeriesSelectionHandler to the pieChart in order to enable the drilldown. I didn’t have to wait for the REST call return to have data either, because I created a PieSeries with my dummy ListStore. This part I’m not that proud of. Because I bind the SeriesSelectionHandler outside the actual MyPieChart object, the implementation violates encapsulation. I could have implemented the SeriesSelectionHandler directly in MyPieChart, but I didn’t want to do this because I felt it would confuse developers later on why a PieChart had a BarChart object in it. I thought it would also set a bad precedent for development because it would seem like we needed to nest objects within objects whenever we wanted to create a drilldown. My implementation, though perhaps not ideal, increased our flexibility because it allows me to create PieCharts that don’t necessarily have to have barChart objects in them and yet still maintain the drilldown capability. In the future, we could create a datamodel that contains a tree-like hierarchy for parent/child drilldowns, where the back button always rerendered the parent, and the drilldown always rendered the child clicked. Something to think about. In any case, here is the binding of the toggleView() method to the SeriesSelectionEvent. That’s it for now! Let me know if you have any questions or comments. In a post to come, I’ll describe how I modeled the google datatables JSON format into a ChartObject and how it’s consumed by GXT charts. Drilling down by clicking on a pie slice. In Sencha’s GXT 3.1 beta, it includes an html file that runs a script that can parse a theme file and generate the approximate look and appearance of several sencha widgets. This allows for fast iteration of .theme development (and enables you to not have to rebuild the theme.jar file with every change). It definitely is extremely valuable in terms of saving time, however, the tool is far from perfect. It’s located in ../gxt-3.1.0-beta-20140225/themebuilder/bin/widgetdatasample/sliceme/index.html. You’ll have to extract the files from the .jar first. An example rendering using the html form included with the themebuilder. It’s difficult to determine what the widgets map to since they are prefaced with the name of the job that the themebuilder uses to “slice” the look into images for cross-browser support for older browsers. Solution: It did work in firefox for me. Solution: Not much you can do here. Hopefully you can get to a point where your .theme is close enough so you can narrow down the widgets that you need to see to fix. Solution: Same as the above. You can’t add custom styling because the .theme file doesn’t support it. If your app uses custom styles on top of the theme.jar, you won’t be able to see them. Solution: There is a reset.css file in the same directory as the HTML file that is used to help style the rendered page. You can add .css classes here and using debug tools or firebug, insert your css class into the widget to see how it would look. You can do the same thing with external fonts. An example of modifying inline styles to get the look and feel right with compiled widgets. Solution: Same as the above. 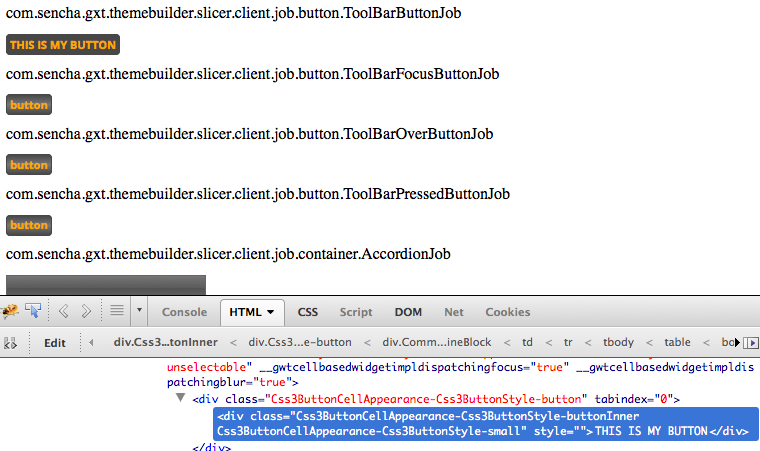 Except modify the inline HTML and add some text inside the innermost div. An example of modifying the inline text of the widget using firebug. * These are the overlays that disable fields. Since they're grey, change the font to white.